The House on Thursday passed a far-reaching bill that would make alleged gang membership a deportable offense for noncitizens living in the U.S. The Criminal Alien Gang Member Removal Act was approved largely along party lines, one week after it was introduced by Republican Reps. Barbara Comstock of Virginia, Peter King of New York, Raul Labrador of Ohio and House Judiciary Committee Chairman Bob Goodlatte of Virginia. Rep. Justin Amash, R-Mich., was the only Republican to vote against the bill. Eleven Democrats voted in favor of it. The measure would make noncitizens who are believed to be gang members, or are suspected of having committed crimes with a gang, eligible for deportation, even if they have not themselves been accused of any crime. Authorities would be empowered to classify as a gang any group of five or more people who have committed or conspired to commit certain crimes, from felony drug offenses and violent crimes to bringing in or harboring people who are in the country illegally. The bill would also make it easier for an immigration official to bar noncitizens from entering the country if there's "reason to believe" they are or were part of a gang. President Donald Trump and top members of his administration have repeatedly associated illegal immigration with criminal gangs and violent crime. 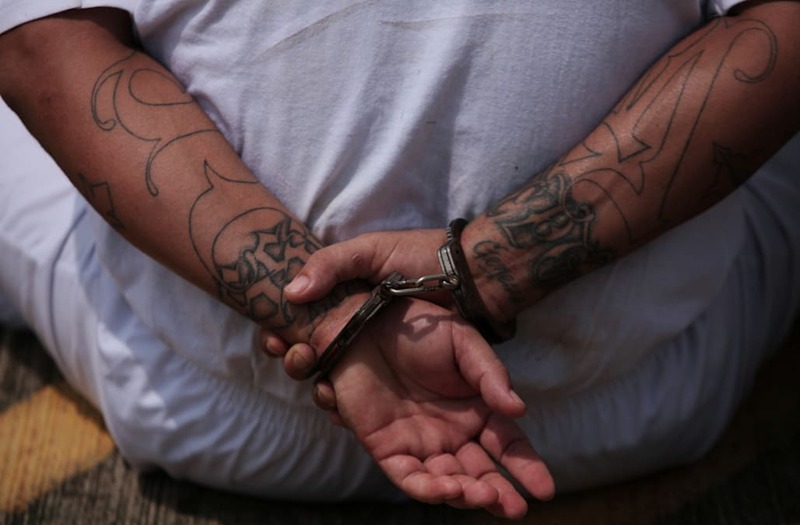 They have focused particular attention on MS-13, a gang started by Salvadoran immigrants in Los Angeles in the 1980s, but which is believed to have ramped up in strength after thousands of its members were deported from the U.S. to El Salvador under presidents Bill Clinton and George W. Bush. "Gang violence is a threat to communities across our nation and we must provide law enforcement more tools to combat this public safety problem," Goodlatte said in a statement. "Federal authorities have found that members of violent transnational gangs, like MS-13, are largely foreign born nationals. We must prevent our nation's immigration system from being exploited by dangerous gang members seeking to bring crime and illicit activity into our neighborhoods." The measure appears to stand little chance of passing the Senate, where Republicans hold just 52 of the 60 votes needed to approve a bill. However, its approval in the House comes as senior lawmakers and the White House furiously debate Deferred Action for Childhood Arrivals, the Obama-era program that has allowed about 800,000 young people who arrived in the U.S. illegally as children to obtain temporary work permits. The Trump administration announced last week that it would rescind DACA, but it gave Congress six months to come up with long-term legislative fix to save the program and its beneficiaries, who are often referred to as "Dreamers." The act approved Thursday could be seen as an opening salvo to set the boundaries of the debate, a move that may show one area where Democrats may have to compromise in order to save DACA. The White House, in a statement, said that the president would sign the bill as passed, arguing that it would "promote public safety by providing law enforcement needed tools to help ensure that criminal alien gang members are deported quickly and never again allowed to enter the United States." Democratic lawmakers, immigration advocates and civil liberties groups were sharply critical of the measure. The act, they say, gives authorities too much leeway to classify a group as a gang. Police and immigration officers, they contend, have already been overzealous in apprehending people they believe to be are affiliated with gangs but have not been accused of other crimes. Some high school students in New York told NPR in August, for example, that they were falsely accused of being in a gang; some were detained and now face the threat of deportation. "The pressing issue facing Congress regarding young immigrants should be a clean legislative fix for Dreamers, not policies like this bill that seek to enact sweeping and unconstitutional new powers to criminalize young immigrants and racially-profile Latinos," Lorella Praeli, director of immigration policy and campaigns at the ACLU, said in a statement. "The violation of the rights of minors that came to this country fleeing violence because of the color of their skin is already too common, completely unjust, and unwarranted. We cannot let this policy become law."